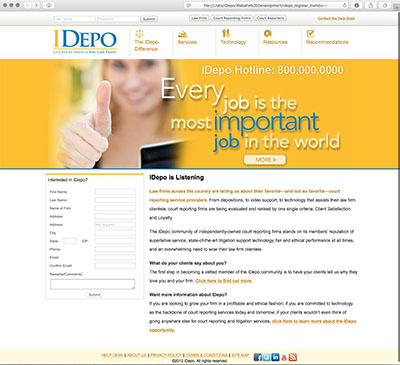 iDepo sought to be the premier network of the most highly respected, independently owned court reporting firms in the U.S. They turned to us to help write their business plan, create the brand and build the necessary websites that would cater specifically to the Legal Community and the iDepo Members. 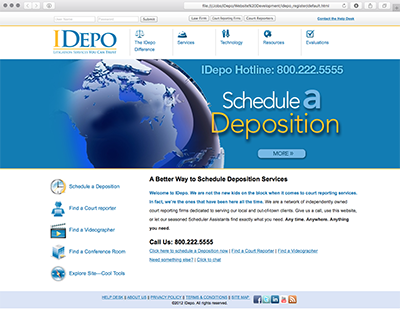 The iDepo website would connect Legal Firms with vetted services with just a few clicks of the mouse. In addition to scheduling depositions online, the cloud-based service would offer training modules, marketing tools, calendar tools and more. For iDepo Members, in addition to the training, marketing and calendar tools, a Member's Exchange would take advantage of synergies in the marketplace to create savings for partners and create cost-saving advantages. While other members of our team worked with the client on creating the business plan and developing the iDepo logo, my challenge was to create the look and feel of sibling websites, creating UIs that carried the messaging and brand while being different enough in appearance that Administrators could easily tell them apart at a glance. Legal Offices would see content specific to their professional needs, such as scheduling depositions. Court reporting agencies and others wishing to join the iDepo family would be subject to a rigorous vetting process. Thanks again for dropping by and if there's more you'd like to know or see, please don't hesitate to contact me. Copyright © 2018 Mark A. Snyder. All rights reserved.